So many whiny Democrats filling this response thread with nonsense and rhetoric that they learned from media. Guess I should expect that, seeing as how they are reading the cnn propaganda machine. Death to tyrants and authoritarians. No army can stop an idea whose time has come. Personal liberty and responsibility will endure. The irony of course is that Obama is about as centrist as you will get in a president. That the radical right views him as some heinous leftist radical is simply a reflection of how out of touch and extreme the GOP party has become in recent years. 1. You didn't fight the revolution; what's this "we" stuff? 2. President Obama does not want to be king, he wants to be president, and apparently, SO DOES THE NATION AS A WHOLE. How dare Obama try to take action that might make it more likely that kids that go to school in the morning get to come home in the afternoon without getting shot with an assault weapon. Who does he think he is? I consider myself to be a strong conservative but I must say Mr. Paul you are way off on this one. We have to take a closer look at our gun laws. Its just common sense. Obama does not wish to be a king. He wants to be a dictator. He behaves like one and he is starting to look more and more like one each day. Must have been a spoiled child in his youth. Maturity eludes him. His false posturing says a lot about our future. Its going to be a rocky road in the tears ahead. If Obama is the King, then I guess that either makes Paul the Fool or one of the Beatles–doesn't matter which. Except a vast majority want stricter gun control. But keep scaring the paranoid gun crowd! Heck, work the bible into it and you've got a surefire winner! I'm sure some bible verse could be twisted to mean "jesus said to have assault weapons". King Obama? I like it. Couldn't be any worse than this preeminent cabal in the House, called The Tea Party, which serves no purpose other than to stall, obstruct, and filibuster each and every piece of legislature that does not serve their particular fatuous agenda, no matter the consequences. I see no difference. So Rep. Rand, if you object to a King, take a look in your own backyard. The Tea Party acts mighty Royal. We have a congress that refuses to act on the will of the people. THAT is a far worse problem. Obama has used executive order FAR LESS than Bush did and just listen to the GOP squeal. I hope he does give them the finger. It's about TIME! The Jurassic thinking of Rand Paul and his antiquated supporters will soon fad into the past but until then, they will not go quietly into that good night. So let them scream, holler, kick and spit . . . Good night Gracie! I wish people would read the article before posting. 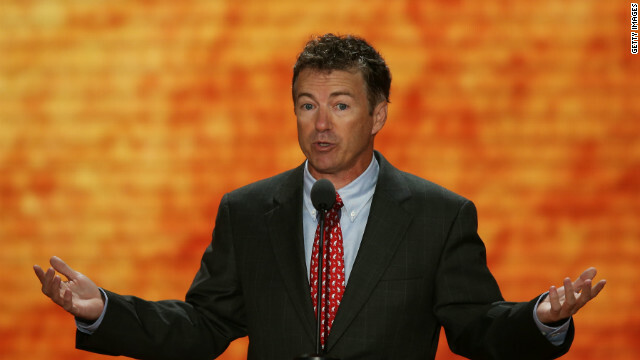 Rand Paul also opposed Bush's executive orders because they by-pass Congress. Regardless of who is in the White House, it cannot possibly be good for our nation to have more power concentrated in the Executive branch. Our Senators and Representatives are the ones we elect to create laws. The Executive Branch should not be able to by-pass them at will just because the President is incapable of creating a concensus. FDR was faced with an absurdly obstinate Congress and yet was able to lead us out of the Great Depression and through WWII. Reagan pulled together Congress and led us out of a downward spiral that started with Watergate. Obama just makes demands to Congress and has proven incapable of creating a consensus on critical issues. Bush wasn't much better. Obama needs to engage congress in a dialogue and find compromises that both parties can accept. He's already begun squeezing more taxes out of all of us and refused to discuss how he's going to reduce spending. He could use the gun debate as a means to demonstrate he can negotiate and compromise but instead will continue down the path of unilateral leadership. Isn't giving the president executive powers part of the constitution Sir? Who stared this "king" nonsense? This is fairly new rhetoric I'm hearing a lot from the folks who can't actually discuss issues. America can now hang its head in shame. What a circus this government has become and it only took the king of the court jesters a little over 4 years to get the show on the road. He would make Ronald McDonald proud to be labeled as a clown. @ larry oakland well said. and to those who think to protect" whatsoever" with firearms DO NOT NEED ASSAULT WEAPONS! He'll have my vote in 2016 if he chooses to run. He's a little liberal in some of his views, not so much in enough of them to satisfy me and he has a lot more common sense than any of the democrats I see speak and more than most of the republicans as well. Obviously, his pockets are filled with NRA and private prison money. Its reassuring that the majority of Americans elected a responsible adult for president who is man enough to know you don't need an assault weapon to hunt or for hobby fun. I love to hunt, yet the US should quite wasting money on our high prison rates and adopt Canada's gun laws. They work great and are adult and responsible. No hand guns or assault rifles, and hunting rifles and shotguns must be locked so kids can't gain access and hurt themselves or others. If they do, then the irresponsible gun owner goes to jail, not the kid. Gun ownership requires adult responsibility. Adults who feel a need to buy and play with assault weapons and handguns are kids that need to grow up. I don't think the President wants to be a king. However I do think Rand Paul wants to be a fool. Bush issued more executive orders than all other presidents put together – and all I heard from the right was how great a president that made him and how Bush had the courage to do what was necessary. Now Obama is considering an executive order and all those some people are screaming bloody murder. I totally agree! While we all want better control over guns like assault rifles. I think the 2nd Amendment needs to be respected. I think Executive orders are cop outs by the president and we gave George W grief for making them. Ron Paul is correct. Any kind of gun legislation needs to come from Congress doing what the Constitution gave them powers to do. Their is a respect for government procedure that I believe Obama does not have respect for. The 3 branches of government are there for a reason. They may not be working so great but they are what we have. well if congress would actually legislate instead of getting paid to complain – the option of executive order would not be needed.